Without knowing who sent the message, and who it was sent to, this pigeon's final transmission may never be decoded. 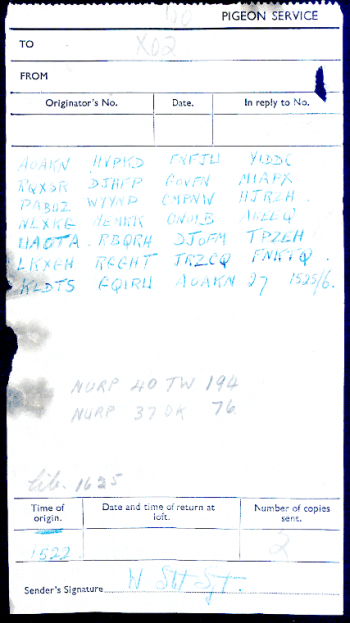 When David Martin found the remains of a dead messenger pigeon in his chimney, the World War Two era coded transmission it carried in a canister on its leg was sent off to the best codebreakers the British have. Regrettably, the best just couldn't decipher the pigeon's final message. The Government Communications Headquarters (GCHQ) may never know whodunit, because it doesn't know who sent it. Messages like these were top priority stuff, and encoded by the sender in such a way that, without access to the sender's codebooks, understanding the message is next to impossible. Use of what was called a one-time pad meant that a random key could be applied to the message, known only to the sender and the recipient. One-time meant that the key was used once only, for that one message. GCHQ doesn't know who sent it; it has no record of Sergeant W Stot, assumed to be the signatory. Without knowing who sent it, GCHQ can't know who it was intended to be sent to. No sender and no recipient means no key, and thus no way of understanding the pigeon's transmission. Pigeons were tagged with the descriptor NURP and a number code, and two of those appear in the message. Tracing those numbers is GCHQ's next move. In the meantime GCHQ has asked that anyone with any information as to the identity of W Stot contact it. There may yet be hope. "The most helpful suggestion we had through all of this," said a GCHQ researcher, "was from a member of the public who suggested that, since the message was found in the chimney, the first two words were likely to be Dear Santa." So at least GCHQ has a lead, of sorts.